What level are the cooking classes? Do I need to be a good cook? Our cooking classes are hands-on, but informal. We have been running our classes for over ten years. Our experience has led us to teach a varied tasting menu with many courses in each class, so that you learn to cook several different dishes. Beginners will not feel intimidated, while experienced home cooks always tell us that they learn many new techniques and methods with us. Ours is not a professional culinary academy – the focus is on learning a lot while still having lots of fun with the group and then enjoying the fruits of our labours together over a relaxed meal. Are vegetarians and others with special dietary needs catered for? We offer one or two vegetarian cooking weeks every year, depending on demand. These use organic eggs and dairy. In addition, we frequently have vegetarians on our other (non-vegetarian) courses; they cook extra dishes (everyone gets a taste!) and they always have plenty of varied and balanced dishes to cook and eat. Other dietary needs can often be catered for. Please ask us! 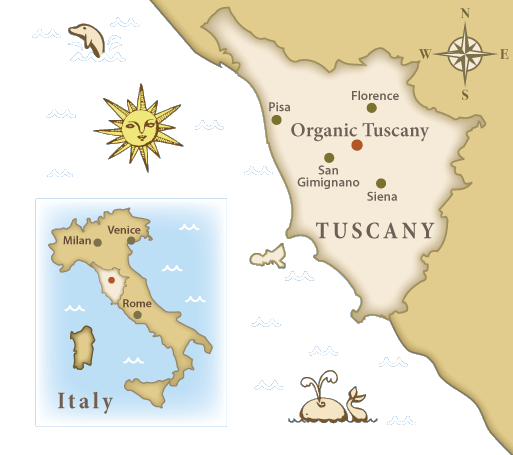 What is the best time of year to come to Tuscany to cook and tour? We run our cooking courses in the spring (May and June) and the late summer/autumn (September and early October). We think that the weather at those times is mild but not too hot (perfect for cooking, eating and touring!) and there is plenty of delicious produce to cook with at both those times of year. How far is the villa from Florence and Siena and other places of interest? The villa is located in a perfect spot for exploring central Tuscany: we are 45 minutes’ drive from Florence, an hour from Siena and half an hour from San Gimignano – you can see its magnificent towers from the garden and the pool! What kind of age are the participants in the groups? Would I fit in? We generally have groups that vary in age from 25 to 65, although we have had some sprightly grandparents and some mature teenagers too. People of all generations generally get on very well on our courses! There is space and time to do things as a group and on your own. How should I pack? Will I need clothes that are not casual? Please just keep it comfortable and casual. Our motto is “pack light!”. You will appreciate this when you take your bags around, especially when you are visiting places before and after your week with us. Pack layers that will work for many temperatures. Keep in mind that there is a washing machine and line. Many people just bring a carry-on and they do fine! Are the classes taught in English? We have a team made up mainly of Italian locals who speak English well. The language that the group uses during the week is English, but if you like, there are plenty of opportunities to learn words and phrases and practise any Italian you may have learned at home. Even a few phrases in Italian will delight the locals: don’t by shy! Why do we need a car for the week? Italian cities have excellent train links. But the geography of rural Tuscany means that the only way to see many places is by car. Distances driven are short and we encourage car-pooling. There is no city driving: we provide a minivan to take you to Siena and back; and on the Florence day, you get the bus from a nearby bus station. Where can I find train information? Most trains are run by the government-owned Trenitalia. Their website is a little annoying. In the English language version, you still need to put the city names in Italian (Firenze for Florence, Roma for Rome etc). Please ask us if in doubt. A new high-speed intercity service, Italo, has started recently. If you book in advance, the prices can be a lot cheaper than with Trenitalia. Where can I find car rental information? If you would like to book with the local Certaldo car guys (Maestrini) you can do so through us. If you prefer to rent at the airport, brokers such as EasyTerra or AutoEurope generally offer very competitive prices.